BRISTOL – Dr. Joseph Foley III, an interventional cardiologist who specializes in vascular disease, structural heart disease and catheter-based treatment of blockages in the heart and other vessels, has joined the Wellmont CVA Heart Institute. Dr. Foley will primarily see patients in his office at Bristol Regional Medical Center and perform procedures at the Alpha Natural Resources Center for Interventional Cardiology there, but he will also have cases at Holston Valley Medical Center in Kingsport. Following a long line of family members who have enjoyed extensive careers in medicine, Dr. Foley has adopted their philosophy of applying the golden rule to patient care. He also learned during his medical training about the importance of treating more than the medical ailment. Dr. Foley is formally trained in cardiac and advanced peripheral vascular procedures, including carotid artery stenting, to open blocked arteries throughout the body. He also works on structural heart issues, such as valves that are not functioning properly and clots in the lungs. He is the second interventional cardiologist at the heart institute – Dr. Rahul Sakhuja is the other – to have received specialized training to perform transcatheter aortic valve replacements. This procedure provides patients who have severe aortic stenosis and are a high risk for open-heart surgery with an alternative that extends their lives. Dr. Foley and Dr. Sakhuja are medical doctors. 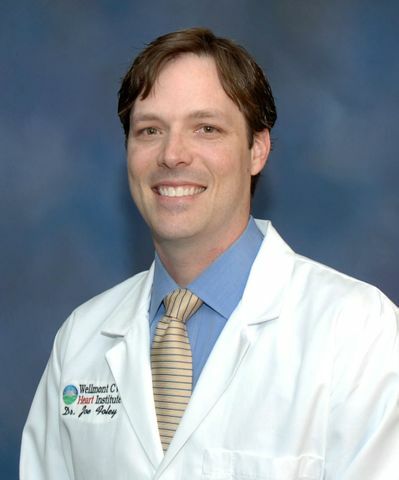 After obtaining an undergraduate degree in molecular biology and microbiology from the University of Central Florida, Dr. Foley graduated from Loma Linda University School of Medicine in California. He completed his residency in internal medicine at Wake Forest University Baptist Medical Center and his fellowships in cardiology and interventional cardiology at the University of Kentucky’s division of cardiovascular medicine. He still recalls the first heart attack patient he helped treat during his interventional cardiology training. He also vividly remembers an amazing story about a woman who developed heart failure during her pregnancy but managed to successfully deliver a healthy baby and then survive a heart transplant. He is drawing on these experiences and his training to bring expert care to patients. Dr. Foley is board-certified in internal medicine, general cardiology and interventional cardiology by the American Board of Internal Medicine. He is also a member of the American Medical Association, the American College of Cardiology and the American Society of Nuclear Cardiology. Dr. Foley noted the heart institute’s relentless commitment to deliver the highest-quality care at the lowest possible cost with the greatest access in Northeast Tennessee and Southwest Virginia. To schedule an appointment with Dr. Foley or obtain further information about him or the heart institute, please call 423-230-6900. More information is also available at www.wellmont.org. Download photo of Dr. Foley.